Today, Foursquare has announced the arrival of version 2.0 of their service. This version has been the subject of much speculation for several weeks, as everyone wants to know how Foursquare is going to keep their momentum alive. With Facebook Places now out in the wild, and slowly rolling out around the world, Foursquare is well aware they need to move beyond simply being a check-in service. So have they? 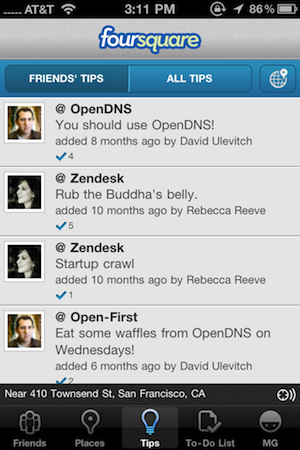 As we suspected a couple months ago, there is a new emphasis on both Tips and To-Dos in the new version of Foursquare. Specifically, in the iPhone app, these features now have their own separate buttons for the first time. And on venue pages, it’s now easy to both add a tip or mark a venue as something you want to explore (to-do) later. Both of these features are somewhat interesting and could be useful, but unfortunately, neither are new. Both existed previously, they were simply harder to access before. Foursquare is smart to spin To-Dos now as sort of an Instapaper for things in the real world (that is, a way to bookmark features in the real world with one-click) — I like that idea, it’s simple. But again, it’s really not anything new. Something that is new is the “Add to My Foursquare” buttons that will begin appearing on the web — but despite the announcement, Foursquare has already had to roll-back this feature as it appears to be melting their servers. When it does work, this will be a way for people reading an article about a place on the web to quickly add it to their To-Do lists. Again, sort of the Instapaper idea. All of this is obviously about discovery. 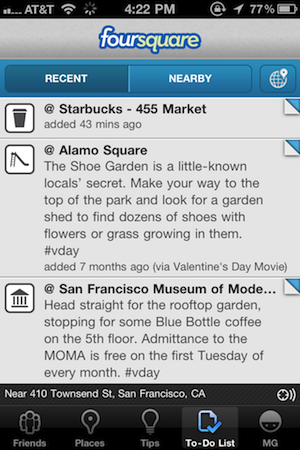 Foursquare wants to be a utility that shows you various interesting things in your city (or one you’re visiting). That’s a very good idea and I think is the core of what Foursquare needs to be. But I’m not sold that they’re executing this yet with these 2.0 features. One problem is that Tips and To-Dos remain a little confusing. For example, you can add Tips attached to a venue to your To-Dos list, but you can also now just add venues without Tips to your To-Do list. You can mark a venue as “I’ve done this”, but what exactly have you done? Gone there? And because Tips resides in a separate column and are still location-based, I’m not sure why you really need to add these to your To-Do list. Can’t you just do them from this Tips list when you’re nearby? Or, if the point is to alter where you’re going based on your To-Do list, why have the “Nearby” button? A few things here just seem redundant and confusing. To be honest, I’m not sure these two things should be separate tabs. The old way (when they were in the same area) was also confusing, but perhaps a slight reworking of this would be better here. Maybe you have a “Friends” area for your social check-in stream, your “Profile” area, and then an “Explore” area which shows you both nearby Places and nearby Tips broken into two sub-sections. Either of these could be added do the new “To-Dos” area of the app, but in two sections: again, Places and Tips. That way you can more clearly separate actual things you want to do from simply venues you want to bookmark to go to later. And you don’t mark a venue with “I’ve done this” — you simply check-in and it gets checked off the list. To me, Places seems sort of useless at this point as a stand-alone section. The check-in button already takes you here when you click it, and if it was one-level deeper in the new “Explore” area, I don’t think it would be a big loss. You’d just have to make sure the check-in button was always visible in the app — which I think it should be anyway. More importantly, I think Foursquare still needs to add some functionality beyond this if they truly wish to move beyond the check-in. Obviously, that’s easier said than done if they’re busy trying to scale with their rapid growth, but time is of the essence here. There should be an easier way to get access to local deals from within the app rather than having to rely on randomly bumping into it when you’re checking-in to a venue. There is a huge opportunity for Foursquare to prove how they can help local businesses by driving foot traffic. They also badly need a complete revamping of the point/gaming system. This gaming element was actually kind of fun in the early days of Foursquare — and there’s something to this idea. But it probably needs to just be among your social circle where you all battle for mayorships (and lower level distinctions). You can still have an overall city-wide mayor of venues (for certain deals), but Foursquare is getting too big now, and it’s too hard for the vast majority of people to get mayorships at popular venues. Foursquare has been said to be working on a new point system for ages. So far, nothing. Also needed are comments and pictures on check-ins. Sure, this would be copying Gowalla, but both are a pretty standard social thing these days (maybe even “likes”?). I see friends check-in a place and I often want to comment on it, but I can’t. This would help with user engagement, a lot. I guess my point is that while Foursquare 2.0 may be here, I’m already looking forward to some real changes in Foursquare 3.0. 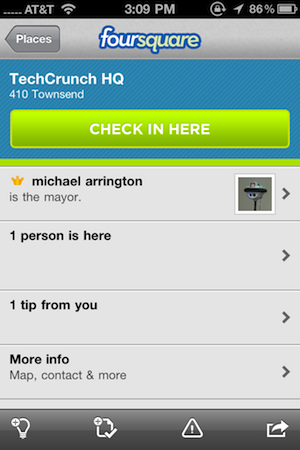 You can find the latest version of Foursquare here for the iPhone. The changes will be coming soon to BlackBerry and Android.